The high mobility vehicle and engineering firm, Supacat, has rebranded under a new SC identity to take the company forward in its successful expansion into new markets and provide a clear customer focus for the company’s products and capabilities. The newly formed SC Group comprises four defined businesses. Solidly established in defence, the Supacat name remains in place for the company’s core defence business; SC Innovation is the new brand for all engineering solutions for non-defence customers; Proteum the new brand for the marine products and services company (formerly MDS Marine); and the Blackhill Engineering brand is retained for the large fabrications and associated machining business. Having successfully outgrown its brand, and whilst retaining its heritage, the new group identity has been created as a platform to allow the company to grow and develop its joint capabilities and bring innovative solutions to its customers across multiple sectors. Over the last decade it has become one of the world’s leading companies in developing equipment for operation in harsh environments in sectors from defence to marine, renewables, mineral exploration, oil & gas and nuclear power sectors, where high performance, reliability and safety are paramount. The company was founded in 1980 to develop high mobility vehicles for defence and civil customers. In 2011 it established Supacat Pty Ltd in Australia and during 2014 made a series of acquisitions in the commercial marine sector leading to the creation of Proteum based in Hamble, UK. At the end of last year Exeter based heavy fabrication specialist, Blackhill Engineering, was acquired. SC Group, the Supacat defence business and SC Innovation operate from headquarter facilities at Dunkeswell, Devon, UK. “The SC brand brings together our people, products and services to create an innovative engineering group structure to achieve our 2020 vision of a diversified industrial group offering a one stop shop of engineering processes. I look forward to leading the SC Group into the future and, working with our customers to exceed their expectations. We have a passionate and committed team with the skills, expertise, focus and passion to provide the highest value to our customers with bespoke quality products and services”, said Nick Ames, Chief Executive, SC Group. · Supacat is the refreshed brand retaining the company heritage for the core defence business. Supacat develops and supports high mobility military vehicles such as the HMT Series (e.g. Jackal and Coyote), LRV400 and SPV400 and provides specialist engineering services for defence customers. · SC Innovation provides engineering solutions to support all non-defence business. 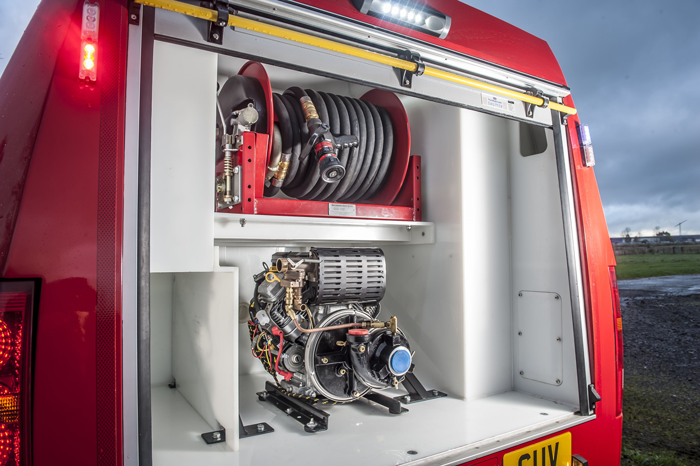 SC Innovation incorporates specialist vehicle work with the RNLI and the emergency services together with products and services for challenging sectors such as oil & gas, marine, renewable energy and nuclear. These include the SMV 24 multi-purpose vessel and a wave energy device. · Proteum is a newly consolidated marine brand within SC Group, formed following the recent acquisition of MDS Marine and Bukh Diesel UK. Proteum represents and distributes a portfolio of marine products and services across UK and Ireland including Bukh, Marine Diesel Sweden, OXE Diesel and Konrad propulsion systems. Proteum also offers global support solutions. · Blackhill Engineering Services, established over 50 years ago and another recent acquisition of the Group, retains its existing brand. Blackhill Engineering serves current and new customers with an expanded portfolio of machine engineering, large fabrication and complex machine assembly services.